The Emirates Industry for Camel Milk Products (trading under the name Camelicious), a specialist in camel milk derived products, has announced the launch of what it claims to be the first infant formula to be made from camel milk. The product is said to be rich in vitamins C, B1 and B2, as well as containing more thiamin than sheep’s, cow’s or goat’s milk. It is additionally claimed to be high in linoleic acid, as well as a group of essential amino acids that “maintain the health and strength of the body immune system”. 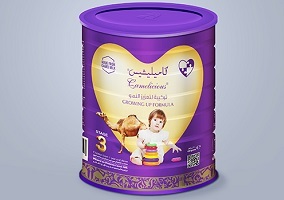 Commenting on the launch, company deputy general manager Mutasher Awadh Al Badry said: “This innovative product is exclusive for babies aged from 1-3 years. It would back up their physical growth, as it contains ten times of iron fount in other types of milk. […] Camel milk is naturally rich in calcium that assists in building up bones, muscles and joints. It helps to protect from congenital malformations and other children growth related disorders”. The firm’s general manager Saeed Juma Bin Subaih added: “Camel Milk represents an integral part of the Arabic and Islamic culture in general and the UAE culture and heritage in particular. This milk is genuinely complements the UAE values and traditions that are handed down from one generation to another”.